This year out of Norway, a strong debut album has arrived from Oslo quartet, Mayflower Madame (Rond Fagernes - vocals and guitar; Rune Øverby - guitar; Petter Gudim Marberg - bass; Ola Jørgen Kyrkjeeide - drums). There is no apologies for the intense presence of this album. Observed in a Dream - with its artwork depicting a bleak mid-winter evening - has eight tracks of psych-theatrical ingenuity, a latticework of shady shoegaze, post-rock and 1980s dark romaniticism, It has that draw that puts you on a downer, and then abruptly elates you. It has an emotional depth in each song that engages you fully, but only if you are willing to comply and let go of your inhibitions. The vocals of Rond Fagernes have a edge to them in their phrasing, somewhere between U2's Bono, Billy Idol and The Verve's Richard Ashcroft. Dark and alluring is the beginning song, 'Confusion Hill' here there appears a vast backdrop of droned guitars reverbed with clear bass and drums grinding along underneath some overdriven clangy guitars. The vocals whilst some of the instrumental sections recall Grunge band Soundgarden's - 'Fell On Black Days'. Clangy guitars and buzzing bass swing along like Iggy Pop's - The Passenger on 'Lovesick' coupled with Rond's vocals switching between a deep moan to aching sighs. Dark murmings by Rond on the intro of 'Self-Seer' slip in and around a moody churning surf rock backbeat that brings in some heartfelt moans A synth shrill moves into moderate paced drums on 'Weightless', with bass and stingy garage rock guitars weaving around some spooky synth interjections and vocals that yearn for your attention, Almost sounding like Rond was caught in a swirling storm. The spaghetti western grunge menace on 'Upside Down (The Death Loop', makes use of chugging guitars and bass, whilst the drums are busy throughout, whilst Rond has an almost well, luring lethargic quality to his vocals. Yet on some songs Rond comes across as a Jim Morrison-type reptilian crooner, as indeed heard on 'Into The Haze(Redux)', which takes you within it's murky garage psych-rock lair, creepy bass, chilling guitar reverbed and delayed. It then for the last minute, proceeds to slide into a half-time stoner rockout. The dense dreamy sound is present more so on the title track 'Observed In A Dream', a love song to a guiding star - maybe even a dark star. The need to still be listening to the last track 'Forever// End of Ever', surely begins to embed the essence of the band, an entity, that seems to seep into everything they produce. 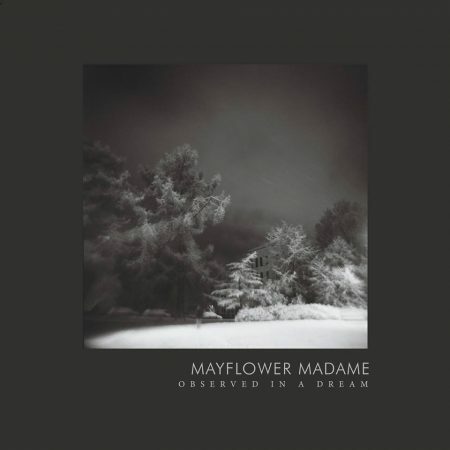 Mayflower Madame have done well to revive an old sound on their debut Observed In A Dream, In the 1980's there were a multitude of artists who dabbled with the dark side, namely the genres of Cold Wave and Goth Rock. Yet the mixing of that sound with Psychedelia and Shoegaze into a fresh format, will surely leave it's noticeable mark in years to come for a new generation.